Joe Marino tips us off. After reading Joe’s note below, click on the image to the right to see a couple of back to back trailers of the show. The trailers may be all you need to see. 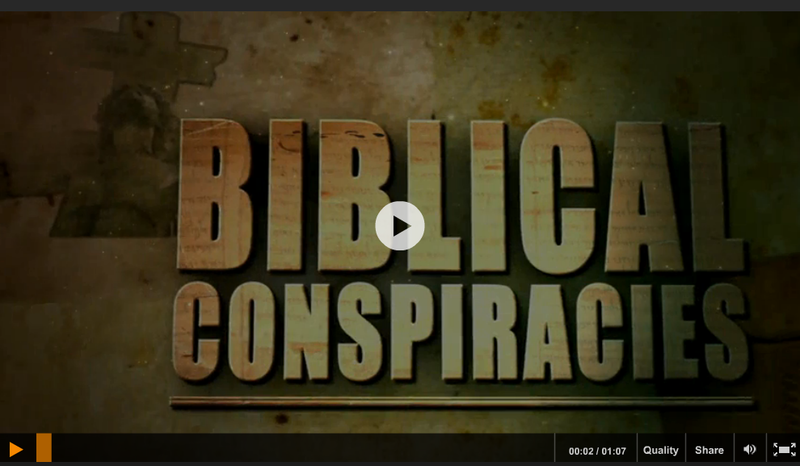 The Science Channel premiered a new series tonight (Sunday) called "Biblical Conspiracies." One of the episodes was titled "Nails of the Cross." The description from the Science website: "Two nails were discovered in the tomb of the High Priest Caiaphas who, according to the gospels, sent Jesus to the Romans, who then sent him to the cross. 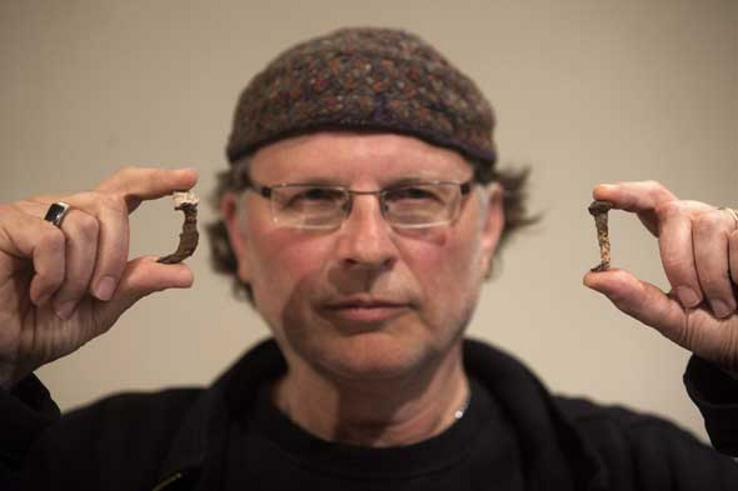 Using high tech tools, scientists try to prove that these nails were used to crucify Jesus." This is a follow up documentary to the recent Simcha Jacobovici program that was on the Discovery Channel I believe, that also sought to prove that the nails may have been the ones used in Jesus’ crucifixion. Many mainstream scholars dismissed his claims out of hand after that airing, but this program features a skeptic of Jacobovici who proves that the nails were, in fact, used in a crucifixion. He found bone and wood on the nails. Before it was proved to be wood (in an altered form), it was thought that it might have been the Shroud. One other Shroud-related point is a depiction of how the nail may have nailed into wood and through the palm. The program shows the use of a scanning electron microscope as well as many other scientific tests and interviews of various scientific experts. There may be two interesting segments. Here is a link to the schedules for . . .
Nails of the Cross: Two nails were discovered in the tomb of the High Priest Caiaphas who, according to the gospels, sent Jesus to the Romans, who then sent him to the cross. Using high tech tools, scientists try to prove that these nails were used to crucify Jesus. Secrets of the Crucifixion: A scientific investigation of 2,000-year-old bones may hold the key to the Crucifixion, revealing that the classical depiction of Jesus on the cross may be all wrong. And then there is also . . .
Bride of God: Gathering dust at the British Library is a 1500-year-old manuscript, written by an anonymous monk. After millennia of rumors, this seems to be the first solid written evidence that Jesus was married to Mary Magdalene. And this is what the Science Channel calls science; it’s kind of like thinking that Ice Road Truckers and Ax Men are history on the History Channel. I have even family members say that Jesus had to marry being a Jewish Rabbi ?? When will people start to think, we are talking about the 2nd person of the Holy Trinity – The Son of God needs a wife??. He had many more serious discussions with the Jewish people and Gentiles – he surely was not worried about looks as being a unmarried human, the divine Son of God!!! Just one question, why is this on the science channel? Shouldn’t this be on the history channel or some religious channel. The science channel has become a real joke. Emmett, Jesus was not a rabbi in the classical sense of the term, only in the broad sense, meaning a “teacher”. Jeremiah was also single. A close reading of the gospels reveals that Jesus believed that what he taught was above Torah. Paul took the point further. Benedict XVI and Rabbi Jacob Neusner have discussed this. He is not an archaeologist, his investigation is agenda-based and filled with distortions, and this applies to the so-called Jesus family tomb, debunked above, the nails in Caiphas(? – the reading is contested),bride of God and the rest. Professor James Charlesworth fell into his trap, then made his way out, realising the mistake he had made. He has also laid other traps and one famous paleographer was caught in one of them and also made his way out. What is this “Gathering dust at the British Library is a 1500-year-old manuscript, written by an anonymous monk.” called? Are there english translations it? The link to Part III is above,and Part IV should be written in the beginning of next year. Delighted to see Simcha Jacobovici and the old crew on a TV series– been a long time—!!! Thanks to the intelligence of the executives of the Science channel for this series. Simcha always presents the most well thought out information backed by research he has done himself. I am a Christian and I have learned more from him than I have from my own years of study in my churches. I think it’s absolutely amazing how people seem to be super quick to dismiss thousands of finding leading towards an answer, but will gladly conclude that the one book “by God himself” is the ultimate truth. Baffles me every time, but I guess everyone have a right to believe what ever they want to believe to make them feel better about themselves. It seems that it has not been understood that that the producer of the documentary believes that the “one book” is “by God himself”. It also depends on which parts of “the one book” he considers to have come “from God himself”. Suffice it to say now that the nails are shorter in length than typical Roman crucifixion nails, it is not proved that it came from Caiaphas’ tomb, there is no certainty that it is the high priest’s tomb, and, above all,there is no DNA material on the nails, as alleged.